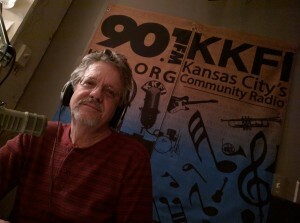 Kansas City, Kansas environmental justice activist Richard Mabion recently interviewed Leticia DeCaigny and Eric Kirkendall on KKFI community radio about the history and involvement of the Moving Forward Network’s zero emissions campaign and the work of the Diesel Health Project in Kansas City, Kansas. 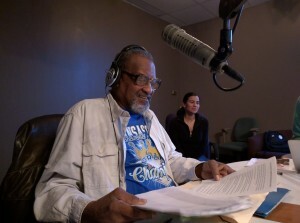 Diesel Health Project Lead Community Organizer Richard Mabion conducts interview on KKFI. Both groups are working on reducing air pollution, particularly diesel exhaust, from freight facilities such as ports and rail yards. Diesel exhaust is a known carcinogen, and is linked to cardiovascular disease, asthma, dementia, and a number of other diseases. DeCaigny said that monitoring she and other members of the Argentine Turner Good Neighbor Committee conducted found levels of diesel exhaust high enough to hospitalize a person a few days after exposure. Mabion said that at one location the pollution levels were so high that they could be fatal. Diesel Health Project Program Manager Eric Kirkendallco prepares for interview. The interview provided information on the recent progress of both groups, similar issues across the country, and ways community members can get involved, such as by visiting the Zero Emissions Now campaign website and signing the petition. Click here to listen to an abridged version of the interview.